Rudy Schutzeus is in the business of making copies, but when it comes to customer service, he’s an original. A four-time Andy Award nominee for customer satisfaction, Schutzeus — known to everyone as just “Rudy”— is Tartan Ink’s copy center coordinator for the Tepper School of Business. Amid a room full of color copiers, printers, scanners, and boxes and boxes of paper, he and his colleague, Scott Wilson, produce Tepper School course booklets and event programs; copies of exams, quizzes and course materials; and flyers, handouts and posters. Their steady customers include Tepper Academic Services, Tepper Executive Education, the Carnegie Bosch Institute, and the many program coordinators, administrative assistants and student organizations in the business school. A 25-year veteran under Tartan Ink Director Patricia Herbster, Schutzeus also is called upon by other departments on campus. “I just did jobs for Computer Science and Chemistry. They call me and come over here because they know me,” he said. Schutzeus also is an original when it comes to his passion — listening to his vinyl records and albums from the 1950s, ’60s, ’70s and ’80s. An avid record collector, his fascination and love for music began as a child when his parents bought him a Red Raven Magic Mirror record player. Today, he plays his singles and LPs on a Technics 1350 turntable with a record changer adapter. He also has a restored Philco 1201 he found on Craigslist. “I’ve been collecting for years. I have everything from Abba to ZZ Top,” said Schutzeus, who lists The Beach Boys, The Platters, Jan and Dean, The Everly Brothers and Chuck Berry among his favorite artists. Schutzeus keeps his record collection on shelving in his living room. “My walls are covered in vinyl. I’m a nostalgic kind of guy,” he said. Have a suggestion for Staff Spotlight? Send it to piperweekly@andrew.cmu.edu. 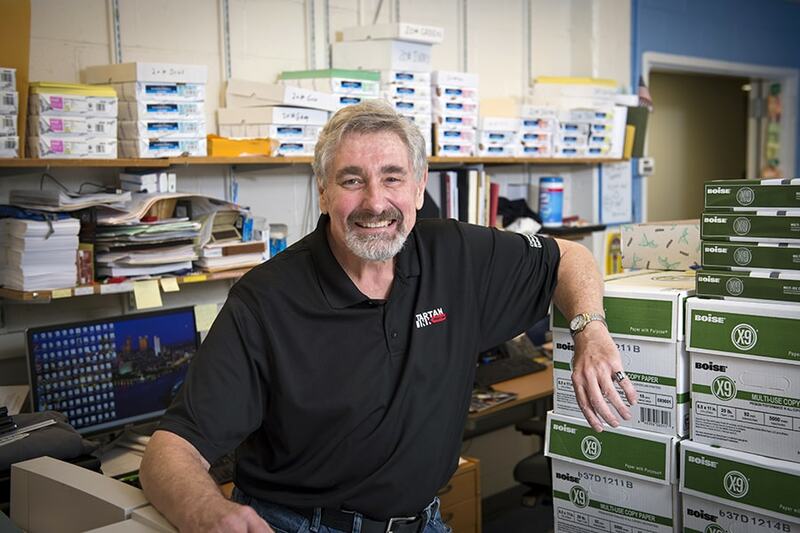 A four-time Andy Award nominee for customer satisfaction, Rudy Schutzeus is Tartan Ink’s copy center coordinator for the Tepper School of Business.